Hey everyone! Sorry I’ve been a bit silent lately, I’ve been a very busy bee suddenly. To let you in on one of the more exciting reasons, I’ve been working super hard getting ready for my stall at the Fattylympics in London on 7th July. 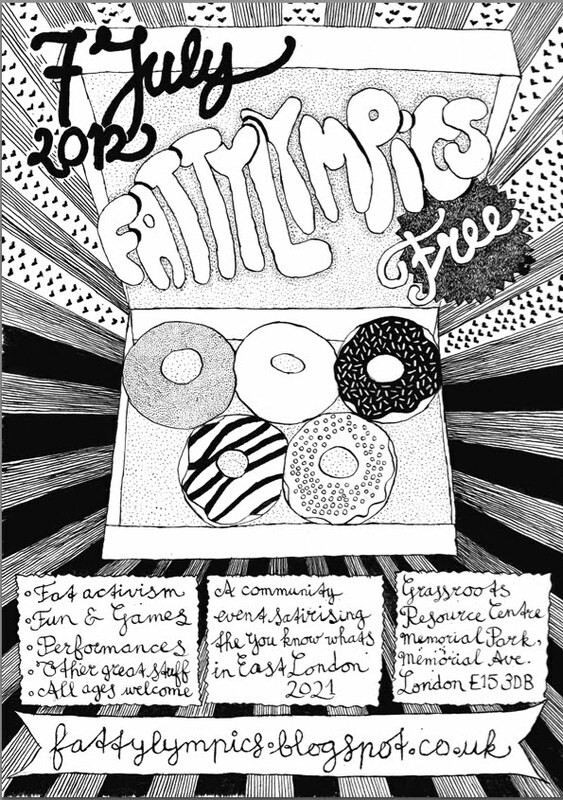 “The Fattylympics is a community event satirising the You Know Whats in East London, 2012. 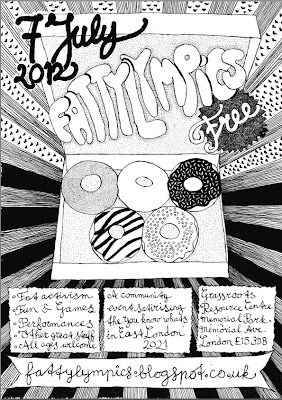 The Fattylympics is organised by two fat activists living in East London, it has been paid for by a series of community fundraising events, and is supported by a handful of volunteers. It is non-commercial. These are some of our values. I’m making lots of things to take with me – I’ll have circle skirts galore, hopefully some dresses(! ), and some other sartorial delights for the excessive dresser in you. I’m trying to make things in a bunch of sizes, but obviously I’m only one person so I can’t promise the world! However, suffice to say, the size selection will be substantially more generous than the high street (in more ways than one, wink wink). I’m also bringing Make It Work #1 AND 2 (which isn’t finished yet, and you can still contribute! ), as well as a cute mini self-care zine I’m working on. I’m hoping there will also be badges and some DIY jewellery. If you’re wanting to see my wares in person, or if you’ve got a project in mind and want to talk it through, come along. My friend Caroline is also having a stall and between the two of us we’ll also be doing some crafty skills sharing! You should come along to the Fattylympics anyway, because it’ll be a fun day filled with activism and community, and one I’ve been looking forward to for eons. Being creative is really important to me. I find being in spaces where creativity isn’t valued to be really tough going because it’s such a paramount part of the way that I engage with an environment – it’s in my choice of clothes, my approach to work and my hobbies, even the dynamics in my relationships. However, being a creative person is also pretty tough on me – most things I do feel like an extension of me, so therefore I take criticism badly and can often shut off when I fear I might face it, which in turn can have a negative effect on me. I wanted to talk about creativity because it’s really central to my own fat activism – I’m passionate about making things, playing with my identity and producing content (both blogging, zines, and academic writing) that creatively counters what institutions have put in place about being fat. Mental health stuff means that being able to do this is very hard on me sometimes, which explains why I am sometimes less present or vocal on here and other places – sometimes what I deal with is just too tough and I need substantial periods by myself to recoup and move on. I’ve not really spoken about mental health and depression on here before, because it’s something I’ve only just acknowledged myself. Often I’ve felt as if the best way to counter these negative patches is to make my creative output as good as it can possibly be – however, as I’m also a perfectionist, I never seem to reach the lofty heights of my ambition, so what I actually let out into the public realm is very limited. To illustrate this, I thought about starting this blog for about three years before I actually did – I’d been a part of fatshion communities both as a participant and through selling vintage clothing on eBay (which I did alongside my postgrad degree), and always really admired fatshion bloggers, but I wasn’t confident in my own ability so I put it off. Eventually I was unemployed for a bit and I started this space as a bit of a diversion – within a couple of weeks and after a miniscule amount of self-promotion, my first readers (most of whom are still here I think!) passed on my links and images, and I had an audience which began to grow and hasn’t stopped since. This blog has become much more than I ever anticipated it could be, and the support and kindness I’ve received has always massively outweighed the critiques and fat hatred that I also sometimes receive. I’m still very much not a “proper” blogger – most of my pictures are unedited, badly exposed and generally full of questionable facial expressions – but it doesn’t matter (maybe it would if I was trying to make money out of this, I don’t know). I love the blogging world because it’s accessible to a much wider variety of people than traditional fashion platforms – I’m not saying that anyone can blog, because I also know that it takes a certain amount of resources to be able to do so (computer, internet access, camera, money for clothes), but rather that some of the hierarchies that have controlled the production of fashion culture have been removed. It’s a more democratic space, even if there are still prevalent norms and levels of privilege that often go unmentioned. I think the fashion industry looks down on blogs now, because they’re two a penny and everyone and their dog has one. However, I think this is what I love most about it. To me, I see a connection between this method of communication and zines and other DIY methods of counter culture – I created this space because I wanted there to be a fat fashion space that was also politically engaged and budget/DIY focused, and because I didn’t know many other similar voices out there. I used to have to imbibe substantial amounts of fat hatred to get my fashion fix, but now there’s no need for that, and that in itself is awesome. I’ve said this before and I’ll say it again – bloggers are awesome, but we could be better. If you feel that your voice is missing from the fatshion world and you feel that you have the time and resources to change that, then do it! I’ll support you, and I know many others who will too. You don’t have to be a fashionista to write a blog, you don’t even have to be a particularly capable writer or photographer, and you certainly don’t need to look a certain way, contrary to what you might think. One of the most powerful aspects of blogging to me is the way that it has highlighted difference and variety in body shape, personal style, gender, sexuality, ability and colour – I love seeing how different people make a similar item of clothing work, because it’s such a contrast to the way I see clothes presented in shops and online (on a uniform, non-relatable body). I guess that what I’m saying is to myself as much to anyone else who’s gotten this far (congratulations!) – you don’t have to be perfect to have a creative output (whether that’s blogging, art, academic work, craft, music, whatever). I’ve always railed against the idea of perfection in aesthetics (being in possession of what society would determine a flawed body), and I guess it’s taken a while to apply this logic to my own creative projects too. Process is a really important part of our creative growth, and focusing on only the end point makes taking any steps towards it a very daunting prospect. If you feel you have something that needs saying, then find a basic forum to start working on it (whether this is yours or someone else’s blog, tumblr, a zine, a painting or art piece, anything) and just take it one step at a time. I started a job last week (yayyyy!) and this is what I wore for one of my office days. It’s a casual office, which is good news after so long corporate temping. I still kind of dress formally, but it’s nice to know that I can dress down when I want, and that my daywear isn’t so intensely policed. All of these pieces are favourites of mine – most of my workwear is interchangeable, it’s perhaps the only part of my wardrobe that I could be capable of making into a capsule wardrobe. Also, as a PS: don’t forget that submissions for Make It Work close soon - and there are spaces for more submissions. Hello! Just a quick outfit today. I wore this to have a potter, some lovely lunch and some book shopping fun with one of my best friends Caroline. You've probably seen it all before, but the dress deserves a repeat outing as it's one of my favourites. I wish all vintage dresses fit me as perfectly as it did! Spring might not have really hit Yorkshire yet, but I've still been plotting ideas for what I'd like to wear when it warms up. I had a nosey on etsy at my favourites this morning, and put this board together on polyvore for you all. These are all plus size friendly (mostly custom) pieces. I'm particularly looking to buy the custom bike shorts soon as I'm now cycling to work everyday and would like a little less, er, exposure when cycling in skirts! Also, they look great for chub rub prevention on long hot days. Visit the polyvore set for links. One top, worn two ways today. I bought this short sleeved knit top in the Next sale earlier this year, but haven't worn it nearly enough yet. I decided the completion of my first pair of 40s-esque high waisted trousers warranted it's reappearance, as the style is quite 40s in itself. Teamed simply both times, the top to see some friends and the bottom outfit for a work related appointment. The trousers worked out well, though I had to remake a waistband as I used stretchy tailoring and it meant the pattern's waistband (with interfacing) was too small. I think I might enlarge the waistband next time too, as though this is high waisted, they could suit a little higher. I made them out of a suiting from my bargain hunting adventures - bought from my favourite fabric stall for £1 a metre (seriously, I wish I'd bought all they had now, it's great! ), and I still have some spare to make a pencil skirt out of. Now I've made them once, I'm already planning another pair in a more adventurous colour/fabric. Oh! And as a side note, I am applying for funding for my etsy shop through the Fund 101 scheme on Enterprise Nation. I need 500 votes, and then I'll qualify for a £500 grant, which will allow me to expand on my current skirt and fabric selection and buy a mannequin to fit and display my wares on. You can see my page here, and it only takes a minute to vote for me. I'd reach my target if about half of my regular readers voted, so if you have a spare moment and want to see more of my wares then please do vote!